← Plan a Wedding in a Month? That’s Crazy!!!! Posted on May 1, 2011 | Comments Off on The Royal Wedding!!!! On Friday April 29, 2011 , the wedding of Prince William and his long time girlfriend Kate Middleton took place. Their wedding was said to have been the wedding of the century, and arguably the most exciting royal british wedding since that of Prince Charles and Princess Diana in 1981. The happy couple announced their engagement on November 16, 2010 . Prince William proposed with the sapphire and diamond engagement ring that once belonged to his late mother, Princess Diana. From the announcement of the engagement until the actual day of the wedding the world was abuzz about every detail of their ceremony and ofcourse kate’s dress. 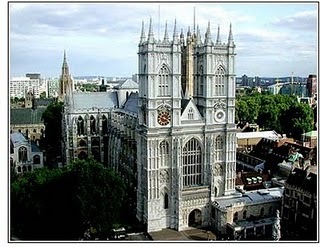 The ceremony was held at Westminster Abbey, a large gothic church in London which is usually used by the royal family for coronations, burials, and ofcourse weddings. There was a small presence of actual flowers but a large presence in greenery because it was said that kate has a love for the outdoors.The trees that lined Westminster Abbey during the ceremony were to be planted immediately afterwards. One of the most guarded secrets ofcourse was what Kate would actually be wearing on her big day. Buckingham Palace was even tight lipped about the designer of her dress fearing that the actual design would get out ahead of time. When Kate emerged from the vintage rolls royce the world got a look at the dress they had been waiting to see for months. Kate’s dress, Which seemed inspired by Grace Kelly’s dress when she married Prince Rainier of monaco in 1956, was designed by Sarah Burton of Alexander McQueen. Pippa Middleton , Kate’s Sister, also wore an ivory gown designed by Sarah Burton. After the Ceremony they headed back to Buckingham Palace in an open top carriage. Once there the newly named Duke and Duchess of Cambridge would be able to stand on the balcony and great their “subjects”. This is also where the ceremonial kiss would take place, However, Prince William is not a fan of PDA’s so they shared two small peck’s. When this was complete the happy couple retreated into the palace to enjoy one of many receptions that would be held in their honor as well as a few deep breathes and private moments. 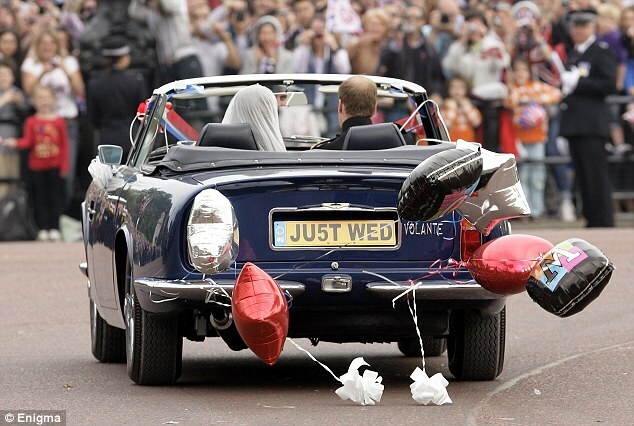 Soon after, the Duke and Duchess of Cambridge emerged from the palace in a vintage aston martin ,belonging to Prince Charles, decorated with balloons and a registration tag that read “Ju5t Wed”. As the future of the british monarchy ride’s off into the sunset it is safe to say that the world will have their eye’s on them for years to come. Now that the two have wed it is almost certain that producing an heir to the throne is in their near future. I guess we”ll all be waiting to see whats next for the Blushing bride and her real life prince. This entry was posted in Uncategorized, Wedding Details, Wedding Style and tagged bridal, Layne Corban, Wedding Day, wedding gowns, Wedding Locations & Venues. Bookmark the permalink.